Photojournalist Yissachar Ruas recounts his unique discovery during a tour of US Navy aircraft carrier USS Eisenhower. Having been sent on assignment last November to the Persian Gulf on behalf of Arutz Sheva, my tensions and emotions were running high. Among other reasons, I was about to travel through 2 countries which, at least from looking from the outside, did not seem like the friendliest countries towards Israelis (something I would later learn was far from true). After spending 2 days shuttling between various airports and hotels, I finally made the unique flight to the aircraft carrier USS Eisenhower, one of America’s most expensive pieces of fighting hardware, and was transported to the carrier on the C-2 Greyhound, also affectionately known as a COD. That was followed by a (relatively) smooth ride and what can be described as a “controlled crash landing" (or a carrier landing) - and I was finally aboard. Aware that, to the best of my knowledge, the last Israeli on active military duty to set foot on the Carrier I was embarking on was Israeli Prime Minister Menachem Begin in 1979, I felt I was in good company. I was greeted by the Carrier’s Deputy Public Affairs Officer Lt Adam Cole, who escorted me to his office and got me settled in. I prepared my gear and discussed my schedule and plans for interviews. After a short conversation we agree that he would assist me in finding one more “person of interest” for interviewing purposes. We left for the Carrier deck to go get a taste of its operational capabilities. En route to the deck we encountered one of the 12 Chaplains aboard the Eisenhower who, upon hearing that I am from the Holy Land he remarked “you know we have a Torah Scroll on the Carrier, right?” Before adding “it survived the Holocaust”. As it happened, I wasn’t aware of that fact at all - what was supposed to be pretty straightforward story now had an added edge to it. I had many questions, but only a limited amount of time allocated to being on the Carrier’s actual flight deck and didn’t want to waste any of it. I quickly asked Lt. Cole to make sure we would get a chance to visit the chapel later on and could see the Torah scroll for ourselves. It really was a once-in-a-lifetime experience, and what transpired during the day can be seen in the video story featured here on Arutz Sheva. The following day, we made our way to the Chapel. I was told an Aircraft Carrier is like a town, but that really doesn’t do it justice It is a "fighting town," where everyone’s duties - from the Fighter Pilot to the Minister and from the Yeoman to the Captain - is focused on one primary mission: do carry their duty and enable the Carrier to do its job to it’s fullest - the sheer work ethic was inspiring to see. The Chapel is the size of a moderate "Shtiebel" [small synagogue - ed.] and probably seats at least 50 people. The chapel is faced towards a corner and the Ark, where the Scroll is placed, is along the left wall towards the front. My hands were trembling. I opened the Ark, and there, resting, was a small-to-medium sized Torah Scroll. Standing there, all I could think was a sense of elation, I couldn’t have imagined that when I was briefed before my embark by the Public Affairs Officer of the 5th Fleet, that when he said the Aircraft Carrier had "everything" - he really meant it! After a brief inquiry, I was told that the Scroll had been donated to the Carrier in 2005 and had survived the Holocaust. My head by then was spinning - how does a Torah scroll survive the Holocaust and ends up on one of the fiercest weapons in the world? I reflected on the fact that when the Ancient Sons of Israel went to war, The Biblical Ark traveled with them. The symbolism was not lost on me. With the little time I had left aboard the ship, I tried my best to gather whatever information I could. On the ship itself I was told that the facilitation of the donation of the scroll was carried out by a Captain Bruce Kahn, and that the Scroll originated from the congregation of a certain Rabbi David Lipper in Akron, Ohio. The dedication I was given mentioned that the Scroll had been saved from the “ashes of Europe,” but nothing further was mentioned of its origin. I left the ship with one main question in my ming: How does such a Torah Scroll end up on an Aircraft Carrier? It is no secret - and was also apparent to me during my trip - that there is no shortage of patriotic American Jews in the US Armed Forces. I encountered many on the Eisenhower alone; but getting a scroll with such a unique history onto a ship, and into a custom-made chapel? That must have been an interesting task. Upon my return to Israel I started actively searching for the 2 people mentioned in the dedication - Rabbi David Lipper and Captain (Rabbi) Bruce Kahn. The initial search proved fruitless, and as I awaited more information from the Eisenhower I was thrust into the events of Israel's “Pillar of Defense” counterterrorism operation when I returned. After almost 8 months of trying, I managed to make contact with Rabbi (Capt.) Bruce Kahn of Temple Shalom of Silver Spring MD. Rabbi Kahn had served in the Navy as a chaplain since 1976, and had served during the First Gulf War in the Persian Gulf. He retired from service in 2002 ad held the position of Chief of Chaplains and the rank of Captain. 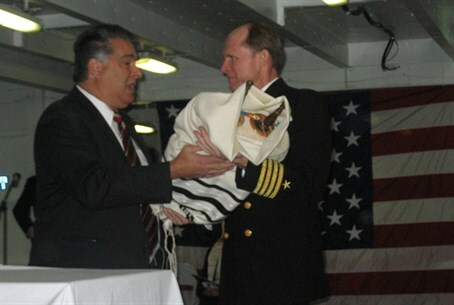 Rabbi Kahn recalls a phone call he received from Louis Colbus, a retired Captain in the US Navy, asking him if he could assist in locating a Torah Scroll for the then newly-commissioned USS Reagan (CVN 76) as per request of an officer serving on the ship at the time - the ship's current Admiral, Herm Shelanski. The request put forth by Rabbi Kahn received 2 immediate responses; the second response was from Rabbi David Lipper of Akron Ohio. Rabbi Lipper (who at the time led the Reform Congregation Temple Israel) recalls the community feeling a deep sense of duty to help the US Armed Forces, and when they heard there was a request for a scroll to serve aboard a US Carrier alongside US troops in a fighting theater their response was prompt. Contrary to what I had been told while aboard the Carrier, whilst the Torah dedicated to the Eisenhower originated from Europe, it was brought to the US prior to World War Two. Hence it was saved the grim fate that so many other Torah Scrolls suffered at the hands of the Nazis. Rabbi Kahn, prior to the donation of the first scroll, had written the Navy’s order regarding the handling of the Torah, whether while at sea or while docking in port. Rabbi Kahn’s own military experience - having having served a long stint in the Navy - gave him a unique perspective when issuing this special order. Rabbi Lipper and members of his congregation from Akron were invited to Norfolk for what the US Navy calls a “dedication” but can only be described as a “Hachnassat Sefer Torah” (Torah dedication) to anyone familiar with such events. The Eisenhower crew prepared a very meaningful dedication and took the members of Temple Israel on a tour of the Carrier. Following the tour was a festive lunch (or rather a “Seudat Mitzva”) attended by the Carrier’s Commanding Officers. Sailors aboard the Eisenhower built the Ark for the Torah and placed it along with the scroll in the Chapel of the Carrier which serves as a synagogue on special occasions and holidays. Key participants were - CAPT Dan Cloyd, Commanding Officer, USS Dwight D. Eisenhower; CDR John Maurice, Command Chaplain, USS Dwight D. Eisenhower; Rabbi David Lipper, Temple Israel; Ken Weinberger, Temple Israel; CAPT Bruce Kahn, CHC, USNR (Ret. ), and Rabbi Emeritus, Temple Shalom, Chevy Chase, Maryland. Rabbi Kahn emphasized that when the Carrier is at sea, an effort is made to bring all the Jews that are part of the Carrier Strike Group serving aboard the neighboring ships to any meaningful services conducted in the Carriers Chapel - providing a unique testament to the American value of freedom of religion inside the US Military.